Electronic Arts has released the first teaser trailer for Titanfall 2, together with confirmation that Respawn's multiplayer mech-featuring shooter's sequel will be a cross-platform release. The original Titanfall, a game which pits teams of players against one another in a parkour-heavy first-person shooter boasting the ability to call down the titular Titan mechs from orbit to add some firepower to the battlefield, was an exclusive for Microsoft's Xbox and Windows gaming platforms. While not perfect, the game was generally well-received - so much so, in fact, that gamers on Sony's rival PlayStation 4 expressed dissatisfaction with publisher EA's decision to sign an exclusivity agreement with Microsoft. 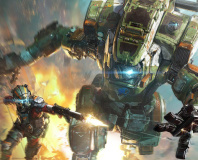 When Titanfall 2 was announced by Respawn chief executive Vince Zampella, it came with the promise that it would no longer be a Microsoft exclusive. Now, EA is prepping the hype train with a short teaser trailer which confirms its cross-platform nature - but brings with it the news that it will be exclusive to current-generation platforms, not sharing the last-generation back-port that its predecessor enjoyed. Titanfall 2, as the game is imaginatively titled, will have a full reveal in June at Electronic Arts' regular pre-Electronic Entertainment Expo (E3) shindig, which will hopefully include information on the planned release date for its PS4, Xbox One, and Windows ports.